Thursday Adoptables will return next week. 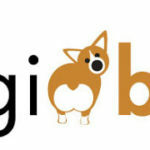 In the meanwhile, click here to check out Corgi Connection of Kansas’s big plans for their third annual Corgi Gathering, this Saturday, October 18th, in Topeka! 1. 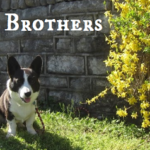 Elizabeth, why did you start blogging about your pets at The Chronicles of Cardigan? The short answer is – like my Blogger profile says – because I can’t resist the urge to tell people about them. With heavy emphasis on the Cardigans, Jon Farleigh and Dewi. But you want more, right? Honestly, I waited 15 years to get my first Corgi, Jon Farleigh, and by the time Dewi joined the family (three months later), I needed an outlet in which to voice my stark-raving infatuation with them. 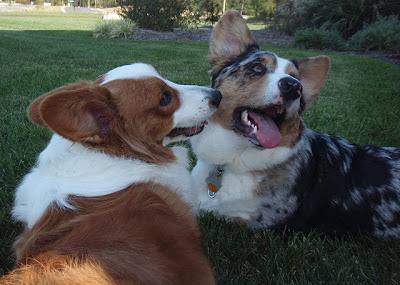 That’s when I got the nerve to start writing at the MyCorgi.com community. After several well-received blog posts there, and inspiration from the vast network of Corgi-bloggers (particularly the closely-knit Cardigan blogging community), I got a yearning to venture out on my own, where I’d have more freedom with my writing (and could include my cats). 2. Do you blog for the same reasons today? Yes, partly. 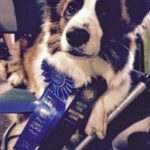 I’m still stark-raving mad about the Corgis, but as I’ve expanded my reach in the pet blogging community as a whole – meeting so many great bloggers (and writers) along the way – and gained confidence in my own writing, the blog has become a catalyst for the writing career I didn’t know I had in me. Really. If you had told me a year ago that I’d be writing this guest post for The Daily Corgi, I’d have laughed you out of the room. 3. So the blog is a lot of work? Yes, it can be – if I want people to keep reading it. The biggest thing is the time investment. Because I’m still learning and, sadly, a bit of a perfectionist, I spend on average two hours a day getting my posts ready to publish (if there are lots of photo edits or home videos involved, it takes longer). Then there’s all the visiting I do to some other really awesome blogs (including this one!) Much of my inspiration for my posts comes from other blogs I read; sometimes all it takes is a word to get my wacky brain going. 4. So what do you like best about blogging and/or your blog? § The community – Without my blog friends, I’d shut it down in a heartbeat. § The writing experience – I’m not disciplined enough to write without an audience. § The freedom to be me – I’m a quiet person by nature, so being able to express myself creatively (without the pressure of someone looking at me – egads!) is therapeutic. § Oh, and getting to celebrate Corgis, of course! 5. What do you like least? Hmm, sometimes I wake up in the morning without a clue for a blog post, and that can add an element of pressure. Though interestingly – the longer I’ve blogged, the easier it is for me to find something to say. I think that’s probably a result of me gaining more confidence in my natural voice (aka my inner child). It’s also hard when good blog friends go away. 6. Where do you see your blog in a year? Hold on; let me ask Jon Farleigh and Dewi. Oh gosh, I try not to plan that far in advance! If I’m still interesting enough to get a guest gig on The Daily Corgi, then I’ll be happy. Elizabeth, I think that can be arranged! Thanks for taking the time to chat with The Daily Corgi! You rock the Corgi socks! 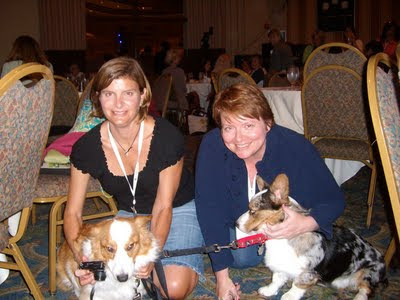 L to R: Elizabeth, Jon Farleigh, Dewi and me at BlogPaws 2011! p.s. 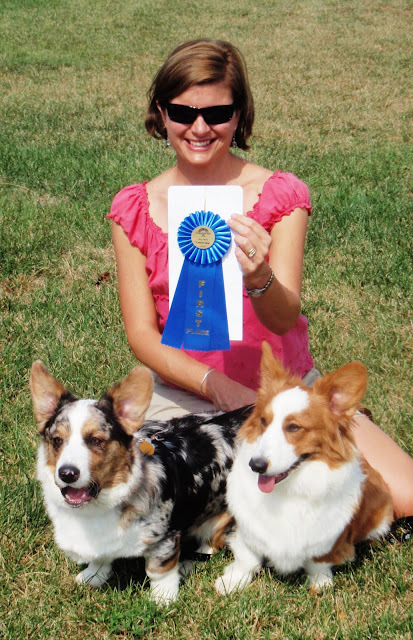 Jon Farleigh and Dewi were Dogs of the Day on The Daily Corgi back in April … click HERE to read their post! 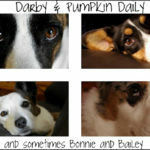 Blue Ribbon Blogger: Darby and Pumpkin Daily! Thanks again for the opportunity, Laurie, and for being so complimentary of us. We are honored! Thanks for the interview. My days always include visits to The Daily Corgi and The Chronicles of Cardigan – two of my favorite sites! Pretty much guaranteed a smile and chuckle from them! Thanks to both of you! My pleasure to give Elizabeth the recognition she deserves! You'd never know how funny she is if you met her. Behind that quiet and reserved exterior lies the heart of a comedienne and astute observer of all things animal. Very nice interview. 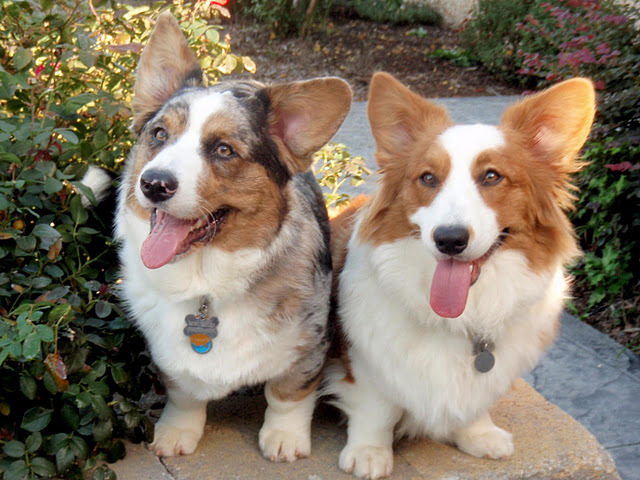 Who can resist Corgis? Dewi and Jon Farleigh you both truly are celebs now! I just want to thank you all for coming over and leaving the encouraging comments. 🙂 You make it SO worthwhile! I wish I could post Tucker's picture to show you!